It started out as a mostly ordinary Monday but our evening ended up being a little bit crazy and frustrating. Beau headed off to work and stopped at the dry cleaner to pick up his clean shirts only to find that his truck wouldn't start afterwards. Again. 3rd time in 3 weeks I think. (Certain on the 3rd time not so certain if it's been 2, 3 or 4 weeks) Previous times he's been able to get it started again with minor fixes and a little bit of help talking with my friends hubby. This time not so much. Abby and I had been about to make play dough when Beau called to say his truck wasn't starting. So we had to go run out and take him to work (which ended up he didn't work because of some mix up - again ugh) Abby asked several times during our trip in the car if we were still going to have time to make the play dough since she could tell the traffic was bad and the sun was starting to go down. I assured her that we would still have time and she was so relieved. 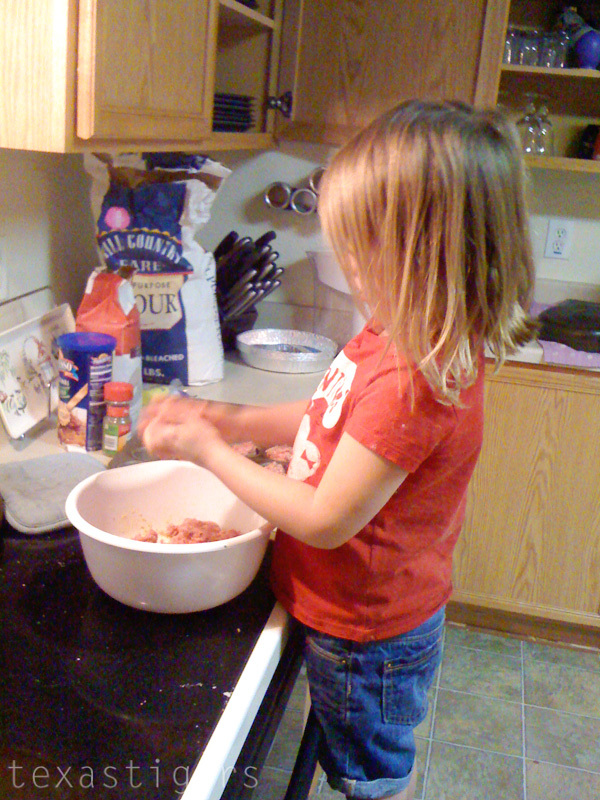 She was such a good helper making the play dough. Then it was time to start dinner and she wanted to help. After a good hand wash she wanted to squish the meatballs together. Since Micah wasn't wanting to get off my hip I figured why not? So she made our meatballs for dinner tonight. Then she washed the dishes. Micah of course wanted to help with that as well which meant not only were the dishes washed but also Micah and the floor were pretty wet at the end of that. I love my little helper! Oh and I put up a new post on Micah's blog if you want to check that out. What great helpers both of your children are! It definately sounds like you had a pretty crazy Monday! Hope your Tuesday was a bit more calm.